I try not to post too many ideas or projects on the blog without clear photo instructions on how to accomplish them. This post would be an exception to that rule. 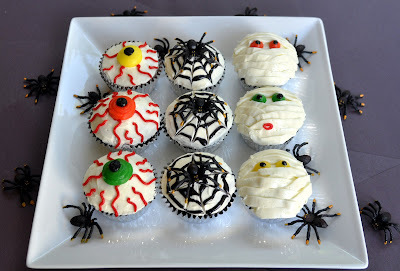 I made these cute Halloween cupcakes before I started blogging, but I wanted to share them! I am also teaching a parent-child cupcake class to make these cupcakes on Saturday, October 29th in West St. Paul if you would be interested in such a thing. Ice a cupcake smooth with white icing. Use red icing (and a tip #3) or a tube of red gel to make the bloodshot look. Use any other color of icing (straight from the tube, or with a tip #12) for the colored part of the eyeball. Top it off with a black pupil using a tip #3 or 5 (or black gel straight from the tube). Ice cupcake smooth with white icing. Make circles using a tube of black gel icing. Take a toothpick and drag it out from the center, pulling the circles to make a web look. Add a plastic spider on top. Ice the cupcake smooth with white icing. Using a tip #47, pipe lines of icing as the mummy's "wrapping." Overlap, and make them go in many directions. Using a tip #3 or 5, add any color eyeballs and pupils. Finish it off with a few more wrappings that come close too, and possibly even slightly overlap, the eyeballs.